It must be said that the world of smartphones with touchscreen displays have launched plenty of new casual games, not to mention complex ones as well which require more than just tapping furiously on the display. Of course, the use of your finger(s) to manipulate a certain in-game avatar might take some getting used to, but what about those who prefer to have something more tactile? Enter the Fling mini tactile game controller from Ten One Design – this particular model will go one step further compared to the Fling for iPad that was unveiled at CES 2011 earlier this year in Las Vegas – being a smaller version that ought to make a splash with other touchscreen capable devices. What does the Fling mini do? For starters, it will play nice with just about any smartphone model on top of the directional pad of any applicable game, helping you achieve an unprecedented level of control and superb response for a fully immersive gaming experience. The Fling mini will come with a special spiral design that actually creates physical resistance for you to experience greater directional control. 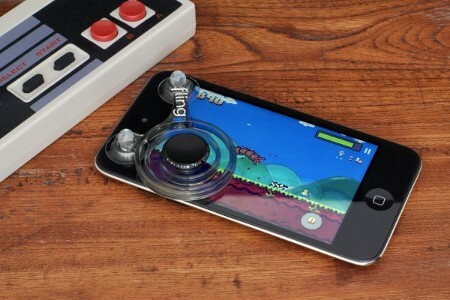 It will function with just about any iPhone or iPod touch game that uses a directional pad or virtual joystick, where among them include Meteor Blitz, Aralon: Sword and Shadow, Super Mega Worm, Robokill, Blade of Betrayal and Dink Smallwood. Just like the Fling for iPad, if you want to make use of the Fling mini, just launch the game of your choice, secure Fling mini’s center control over the game’s directional pad and you’re more or less good and ready to go – all there is left to do would be to place your thumb on the center control in order to experience unprecedented ease of navigation in-game. With a translucent and flexible design, it will offer an unrestricted view of all on-screen action. Not only that, throwing in suction cups will pave the way for simple attachment and detachment for spontaneous gaming sessions. Each purchase will come with a microfiber bag, making it perfect for on-the-go storage while doubling up as the perfect screen cleaning cloth that will help you do away with unwanted smudges and fingerprints. You can purchase the 2-pack Fling mini for $24.95 if you (and your gaming fingers) are interested.